In Progress | That's Knotty! I haven’t made a post in a while, and I’m afraid I don’t have a whole lot to say today. Over the past couple weeks, I have been working on a blanket. It’s been slow going because Florida in the middle of summer is just WAY too hot to have a blanket building in your lap. Neverless, I have been working on it bits at a time, and I’m about three quarters of the way finished. I am using the corner to corner (c2c) pattern, and it’s the first time I’ve ever done it. I do like the pattern, but it’s such a yarn eater! For my lap sized blanket, I’m going to end up using about 7 skeins of Red Heart Super Saver yarn. I apologize for the crappy, cell phone photo, but I wanted to share my progress. 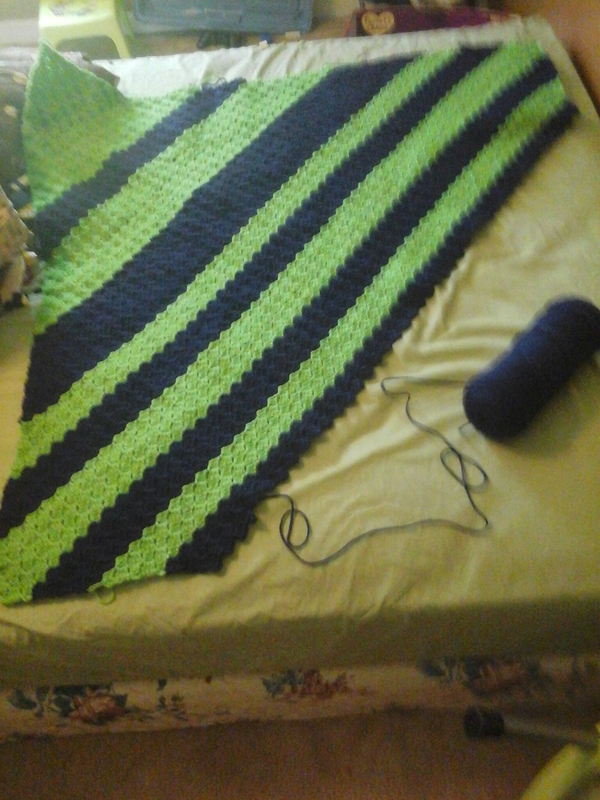 Its 58 rows wide and I plan to repeat the color pattern the same way I started. I’ve got about 42 rows left to do, and then I just have to decide on a nice border pattern. I’ve gotta say, I am looking forward to this project being completed!